Raise your hand if you feel pressured to have gallery representation as an artist. If we were all in a room right now, it’s safe to say at least 90% of you would have your hand up. While working with a gallery does provide a seal of approval for your art business, what matters more is that you are actually selling your artwork. Why? Because each sold piece acts as its own stamp of approval, and you can use the funds to continue making art. Without gallery representation, you have to find a way to sell directly to art buyers. And, studies show that more and more buyers are turning to social media. Use your social media channels frequently and complete them with professional profile pictures and “about” sections. Just don’t use so many channels that you can’t keep up with all of them. It’s actually better to pick one or two outlets and do them exceptionally well than have a bunch of neglected accounts. Want to know which ones are right for your art business? Check out these social media pro-con lists. Just like with social media, go where the buyers go—and that includes art fairs. Buyers of all kinds attend art fairs to see what catches their eye. So, follow these art fair do’s and don’ts and send them on their way with a newly purchased piece in hand. Another way to attract potential buyers to your booth: spruce up your selling space. Try out one of these affordable, DIY booth options you can build in a weekend. You are going to need a professional way to display your work, and Artwork Archive is just the place. Your Public Profile Page acts as a mini online gallery that you can instantly show to potential buyers. 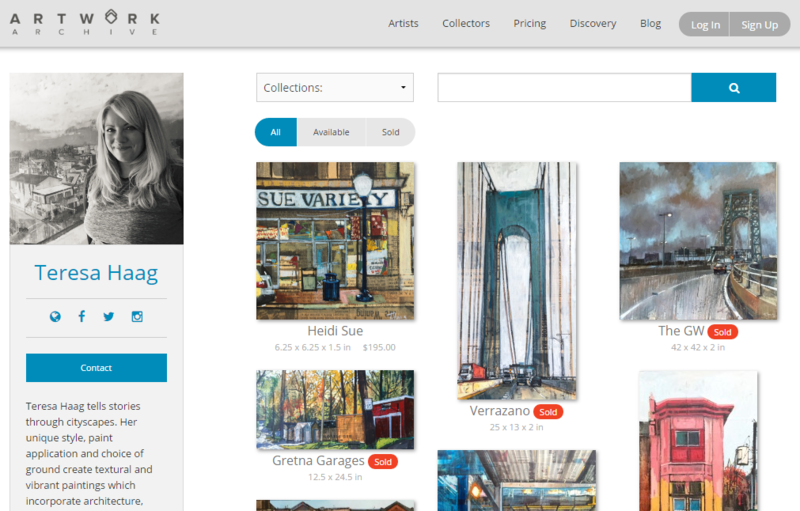 With Artwork Archive, you don’t need a gallery to help manage your art career. Find a client’s contact information or the details of a piece at the drop of a hat. Track your inventory, art for sale, and what’s been sold. Generate invoices and other professional reports for your buyers. Artwork Archive gives you the tools you need to manage your own art business successfully. Learn how to promote your Public Page to increase art sales, and sign up here to try Artwork Archive free for thirty days. Teresa Haag’s Public Page has beautiful photography, links to her social channels, and includes a comprehensive bio. Creating a website or blog for your art business is an easy way for customers to find your art online. The key is to remember that potential buyers will judge your art business from it. In order for your site to be useful and help grow your art sales, it must be up-to-date, high quality, and working correctly. Because whether it’s updated or not, it is on the internet for your audience to see. Make sure you double check these five website issues that could be hurting your sales. Then once your sites are in good condition, don’t forget to promote! Buyers won’t remember or be able to find your work online unless you are actively promoting yourself and including links they can buy from. TIP: Your Artwork Archive Public Page works in tandem with your artist website. Just like your Facebook page, it is one more place for prospective customers to view and interact with your art. For example, artist Lawrence Lee links to his Public Page with a “View Current Work” button at the bottom of his website. And, Lee has already sold over $20,000 worth of art from his Public Page. You’ve taken the time to build up your contact list, now use it! Debra Joy Groesser sells a painting from every monthly newsletter she sends out. In your newsletter, give supporters something to be excited about. Try hosting a giveaway or present them with first dibs on your new artwork. Recap your latest residency or reveal your latest inspirations. The ideas to delight your fans are endless! Sharing this exclusive window into your creative life and chance to buy your artwork will make others want to join your mailing list, too. Another way to sell art without gallery representation is to work with retailers who sell your work in their shops. This could either be through consignment (where both you and the retailer share the profit when the artwork is sold) or through wholesale accounts (when the retailer purchases your work up front and then marks up the price to sell to the public). Artsy Shark’s Carolyn Edlund explains that wholesaling is a great option because the retailer already owns your artwork and therefore has more incentive to sell it. Then when they sell your art successfully, you can build an ongoing relationship with them and bring in a consistent income. Consignment, on the other hand, is a bit trickier since you don’t get paid until the work is sold, explains Edlund. She advises always having a contract in place to make sure you get paid your fair share. Business of art expert Barney Davey maintains that there are four times as many interior designers as art galleries in the U.S. 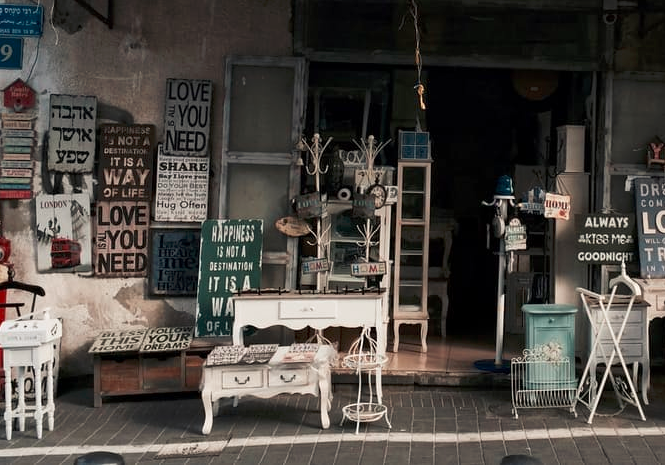 So, if selling to retailers piqued your interest, you should also greatly consider the interior design market. “One of the most fun ways to make money as an artist is to get your work printed on products and sold in retail stores,” advises artist and art business consultant Laura C. George. And, you can do so by licensing your art out to manufacturers. Want to know how to get started in art licensing? Begin by searching online for art publishers, researching companies other artists are using and calling manufacturers that make products you’re interested in printing your artwork on. Artists like Robin Maria Pedrero and Tyler Wallach have found great success merchandising their art and kindly shared their advice with us earlier this year. Of course, commissions are always a viable option to make money outside of a gallery setting. But, if you’ve been hired to create a custom work of art, you need to be prepared and realistic about what goes into the process. Before you commit to an art commission, cover these ten questions to avoid any hiccups. Examine your schedule, personality, and artistic goals to make sure it’s the right fit for your art business. Then, go over some important points with your client so you are both on the same page about the process. Doing so will turn commissions from a headache into a lucrative business strategy. Now you’re ready to get creative about how to sell your art. While gallery representation is helpful, it’s not the only option for artists to sell art. In fact, the most critical element of selling your work outside the gallery system is the belief that you can make a living as an artist, insists Cory Huff of The Abundant Artist. Enthusiastic buyers are out there. All it takes is some hard work on these nine avenues to reach them. Looking for an easy way to manage your art career? Sign up here for your 30-day free trial of Artwork Archive. Unleash the powers of Instagram, and it could turn into a money-making machine for your art business. 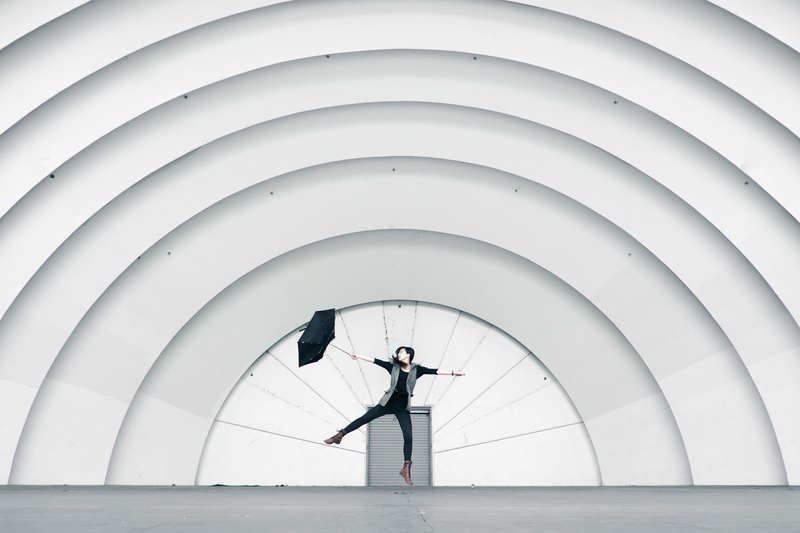 10 Things Every Artist Should Do Before 10 A.M. Successful artists and entrepreneurs follow a morning routine to maximize their productivity. Are you starting your day in the best way? Every deadline for art opportunities, artist grants, artist residencies and art competitions coming up in March.